Before we go any further, let’s have a quick word about pricing. Vitus is the in-house brand of internet cycle retail giant Chain Reaction Cycles so the Venon VR is on semi-permanent sale. That means, as we write this, that the official price of £1,399.99 is actually reduced to £879.99, which is a simply incredible deal. At 8.3kg for a 55cm bike it’s also commendably light. Vitus hasn’t gone all-out with the through-frame cable routing: there is a bit for the rear brake, but that’s all. 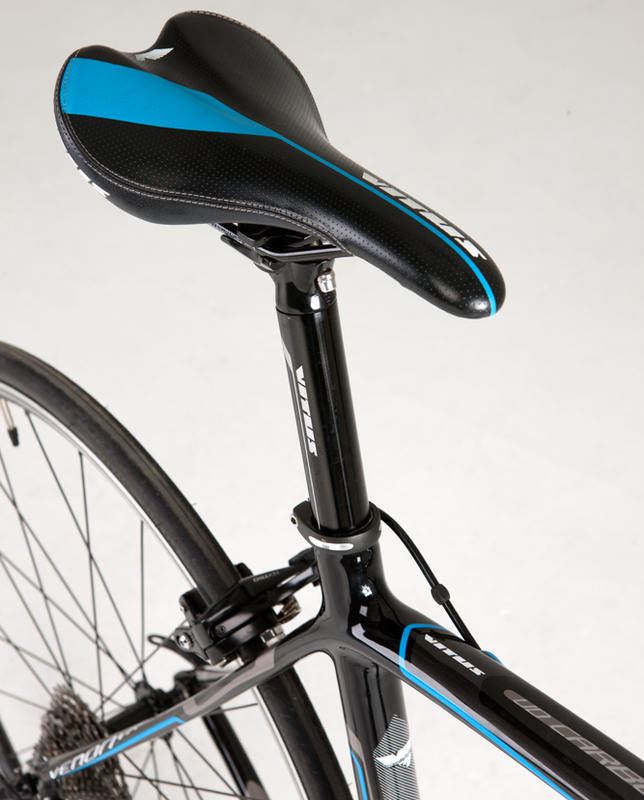 More interesting is the thick, wide wishbone at the top of seatstays, which is very unlike the slender separate seatstays we traditionally find on road bikes. The chainstays have been nicely sculpted, though. There is one little quirk: the seat tube angle is just a fraction more upright than the other bikes on test — really, we’re talking less than a degree — but combined even this small amount combined with a relatively compact front end, has you initially feeling positioned just a little up and over the bars. The good news is that the Venon VR comes with Shimano 105 levers and derailleurs, which rarely miss a beat. 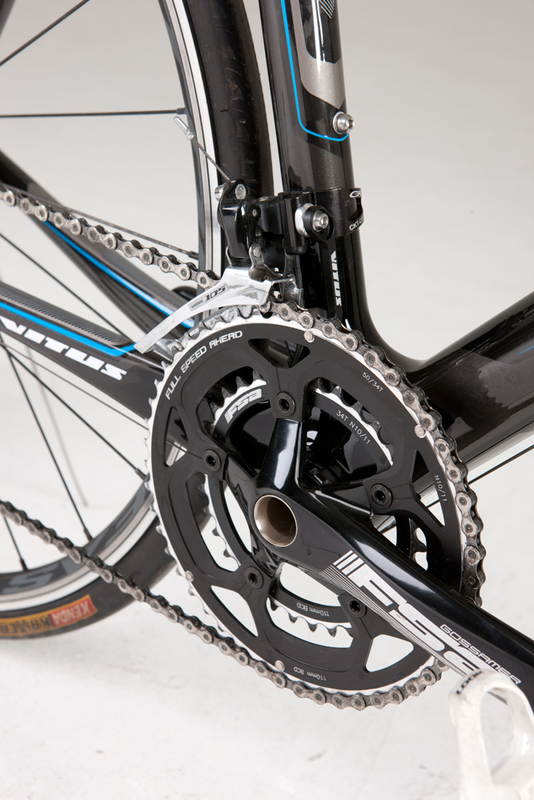 And if they do, Vitus has fitted a little chain drop catcher at the front. The 12-28-tooth cassette hedges its bets a little — the new breed of drop-bar leisure riders who have no racing ego would possibly prefer a 30 or 32-tooth sprocket. Unfortunately the 105 rear mech found on current bikes won’t stretch to such lengths — Shimano’s new 105 groupset that’ll be found on 2015 models will rectify this. In any case, we also don’t find a 105 chainset fitted to the Venon VR, but we have no problems with FSA kit. A bigger omission is the lack of 105 brakes — the Tektro stoppers fitted are no more than average. Vitus own-brand bars, seatpost and stem are all fine but the Easton AXR wheels are a tad lifeless. It’s quickly apparent the Venon VR’s front end is very aggressive and direct, while the rear is a little less so. While that might be fine for racing folk, for sportive-type riders the whole ride is just a bit too jarring over rough stuff, even with the modicum of extra cushioning that comes with the supplied 25c tyres. It’s certainly eager though, and responds well to out-of-the-saddle climbing or big efforts. It would respond even better were it not for the rather lacklustre wheels, which tend to dull the frame’s enthusiasm. Overall, the VR is a bit of a halfway house — almost thrilling enough to be exciting, almost forgiving enough to be a great sportive bike. In many respects the Venon VR is a very positive bike, it just doesn’t quite all click together for us. The spec also has a slight mix and match approach, although at the price it’s currently retailing for it’s a very tempting package.